Even the most exciting and memorable days can be filled with seemingly unmanageable stress. Such is the case in planning a wedding. Using hypnosis as a way to relieve stress and organize your self will help reduce the pre-wedding tension. Even the closest of couples tend to argue and lash out at each other when planning a wedding. So much emphasis is put on this one special day and the pressure to have everything perfect can be overwhelming. With hypnosis, both bride and groom and parents of the intended can keep a proper perspective on the event and approach the day with peace and happiness instead of anger and stress. Many engagements are a year long or longer. With the longer engagement period there is more time for planning, but also a longer period of time for stress. Trying to book the right reception hall or find the perfect dress can stretch out over months. This type of extended stress can be unhealthy both mentally and physically. Using hypnosis to get through the organizational issues and to help you learn how to really relax will keep you healthier throughout the planning process. Hypnosis can relax a person in a way that completely removes emotional and mental stress of every kind. Used alone, hypnosis is an effective stress reducer. Used with hypnotherapy, hypnosis goes one step further. It can change behaviors and habits, even those of the habitual worrier. 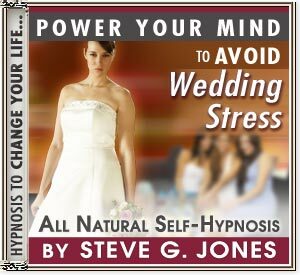 With hypnosis, planning a wedding will be a more enjoyable experience. You will feel more in control and organized, which will in turn reduce stress levels. Dr. Steve G. Jones M.Ed. is a clinical hypnotherapist who developed a self hypnosis program called, “Manage Wedding Stress.” Begin it at least 3 weeks before delving into the heart of your wedding plans. The program used over 21 consecutive nights will make each day of wedding planning something to celebrate.